Porsche has unveiled the new Macan in Shanghai. 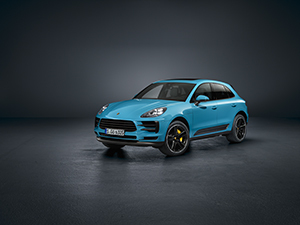 The compact SUV has been a great success since its launch in 2014, and the latest model brings further enhancements in terms of its design, comfort, connectivity and driving dynamics, allowing the Macan to remain the sporty flagship in its segment. Through the new Porsche Communication Management (PCM), the Macan offers total connectivity and numerous digital functions. Above the typical Porsche rising centre console, a full-HD touchscreen has been enlarged from 7.2 to 10.9 inches and is incorporated seamlessly into the newly designed instrument panel. As in the Panamera and Cayenne, the user interface on the infotainment system can be customised using predefined tiles. The air vents have also been re-designed and are now positioned below the central screen.